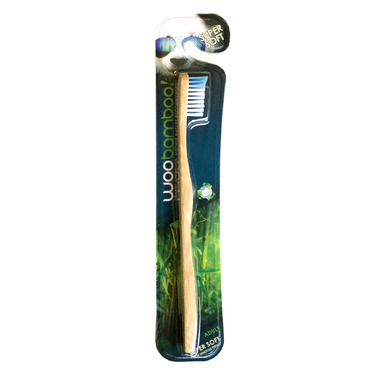 Woobamboo Bamboo Toothbrush Super Soft has an ergonomically curved handled, and super soft bristles. The handle is made from organically grown, sustainable, biodegradable, and antimicrobial bamboo. The recyclable bristles are Dupont Tynex, arguably the best quality and most trusted bristle available. Finished with your Woobamboo? Pull out and recycle the bristles, and throw the handle into your compost where it will gently biodegrade. These tooth brushes are "Dentist approved, Mother Nature recommended". Awesome product! I have extremely sensitive gums and the bristles are so soft and yet still clean my teeth. Highly recommend - especially if you are looking to ditch plastic!